Sabelt was founded in 1972 o­n the initiative of Piero and Giorgio Marsiaj. Starting as licence holder for Britax (a British company in the sector) it became, in a short space of time, the largest seat belt manufacturer in Italy. 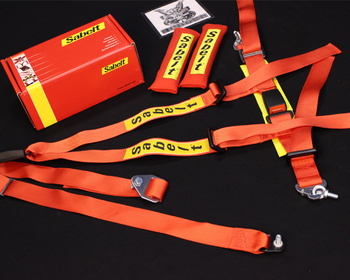 Today Sabelt researches, develops and manufactures racing car seat belts at the forefront of technology, supplying the main racing car teams worldwide. As a result of its experience acquired in the area of racing safety, from October 1998 Sabelt began to extend its activity by distributing a whole range of accessories, all approved according to FIA standards : seats, suits, gloves, special technical clothing for drivers and mechanics, shoes, steering wheels, helmets, pedals, strut bars and springs. Eddie Irvine in 1999 and Rubens Barrichello in 2000-2002 and 2003 are the F1 drivers selected by Sabelt to endorse these high-quality products.